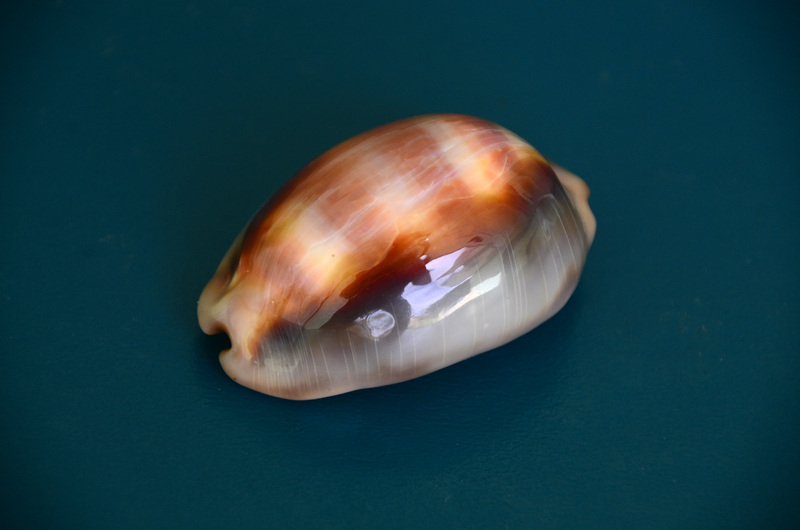 Lyncina ventriculus Lamarck, 1810, is a very heavy massive shell, easily identified by its four dorsal bands that are almost obscured be a thick callous that reaches to the top of the shell. Although Lyncina ventriculus is placed in a large group of cowries, it stands alone with no close relative. When the scientists subdivided Lyncina, they isolated Lyncina ventriculus by itself. Lyncina schilderorum and Lyncina carneola are similar but quite different. Although not rare, Lyncina ventriculus is difficult to obtain. Whereas most cypraea are collected by the dozens, ventriculus seems to be found one at a time. It’s distribution supposedly ranges from the Philippines thru Polynesia, however only occasional specimens from Tahiti and the Visayas in the Philippines reach the market. Polynesian specimens are much smaller in size than their Philippine relatives. Our specimen is a giant, almost 60mm in length. It has glossed over growth stress lines on the dorsum which is typical for ventriculus; true gems are a rarity. Otherwise it is a beautiful specimen. Ventriculus fades rapidly after collection. Fresh specimens are vibrant with the upper reaches of the callus black but this rapidly fades to grey. Even storage in darkness will not prevent the fading.